In a pot, add water, butter, sugar and salt. Mix together until butter melts and water boils. Turn off heat when water boils and add flour. Mix until you get a dough. Place dough on a mixing bowl and let cool for 5 minutes or so. In a small bowl, beat eggs with vanilla extract. Then add to mixing bowl with dough. Blend until thick and smooth. Heat your frying oil to 350 deg F.
While heating, fill pastry bag with dough. In a separate bowl, prepare coating by mixing sugar and cinnamon. When oil is properly heated, push snippets of dough in the oil and fry them for 3-4 minutes. Remove from oil and place on top of paper towels to drain oil. 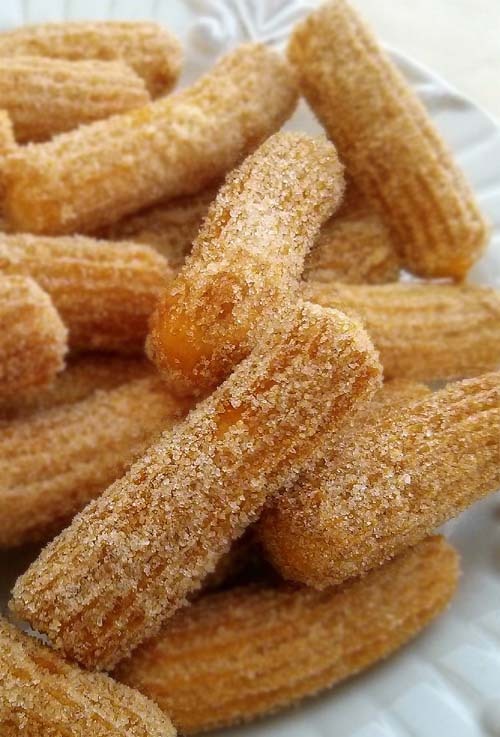 When oil is drained, coat each churro with sugar and cinnamon. Now, here's the source video. She uses a deep fryer to cook the churros.